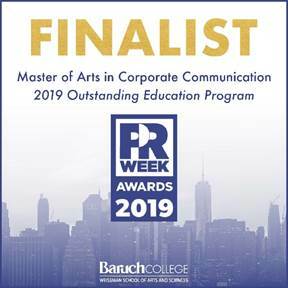 This represents the second consecutive year the MA in Corporate Communication program has been selected a finalist for the award by the leading industry magazine. Baruch will compete against American University, Boston University, DePaul University, and Elon University for this category’s trophy at the 20th annual event on March 21, 2019 in New York City. Graduates of Baruch’s MA in Corporate Communication program have successful careers in public and private companies, not-for-profits, government agencies, public relations firms, and as independent consultants. There are approximately 60 students enrolled in the program for the 2018-19 academic year. A full list of the 2019 PRWeek awards finalists is available here.